It was a busy news week with International Trade and North Korea but the equity and debt markets stayed rangebound with volatility infecting the currency and commodities markets. Central banks (US & Euro Zone) made announcements that they were going to withdraw their purchasing of bonds and a promise to raise interest rates very gently (enter sandman). We are seeing inflation metrics (PPI & CPI) percolating so the bond markets may put central banks to the test in the coming year if it begins to accelerate to the upside (see more below). Complacency is beginning to come back into the picture which may mean a euphoric move to the upside in the coming months in the stock market. However, a test of the rally from the past six weeks is likely in the coming sessions. Finding support and carving out a bottom next week will set the markets for new all-time highs across the board over the summer. A move below the 5/29 low and we will see a spike in volatility and lower prices. I am leaning towards new-highs but not without a successful test a bit lower next week. Technology looked weakest into the close on Friday. 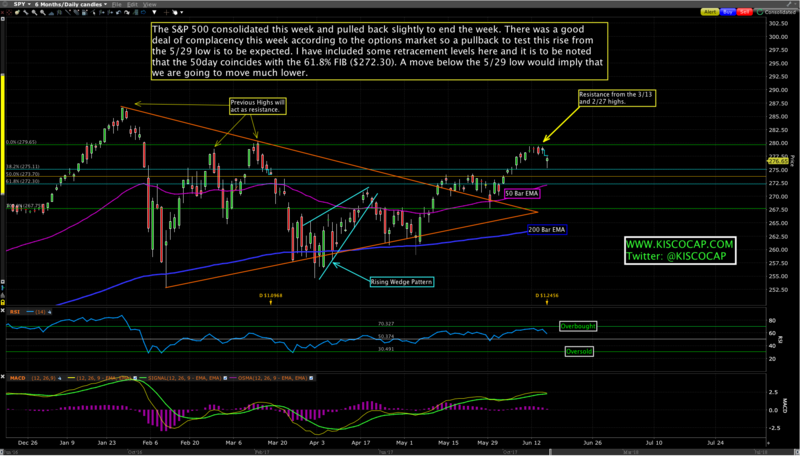 It should find a bottom by mid-week if we are to begin another leg higher in the broader markets. Volatility in currencies is likely to continue. Emerging markets are impacted to the greatest degree. The 10YR Treasury bond. Should stay under 3.1% to keep equities happy. 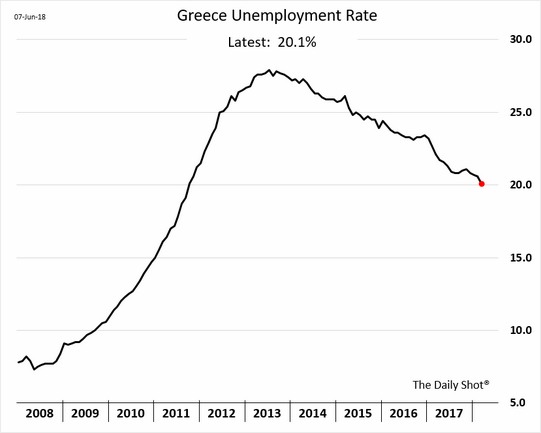 Greek unemployment edges lower, but the rate remains above 20%. 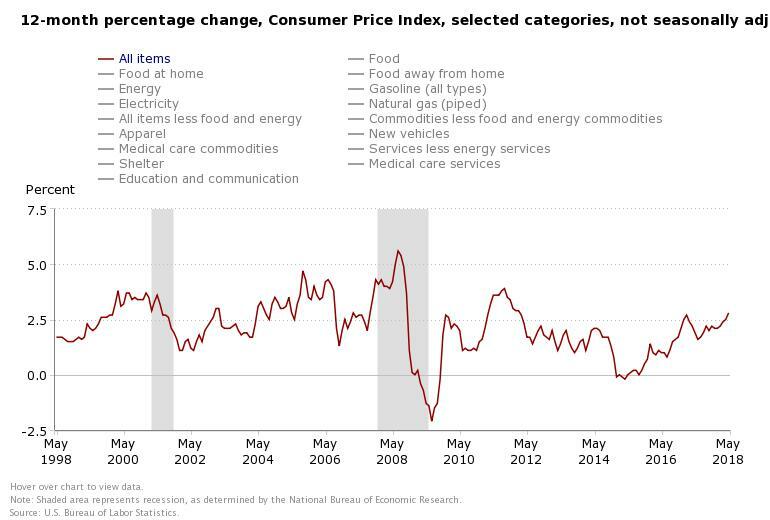 US consumer prices climbed in May at the swiftest pace in six years as the Consumer Price Index (CPI) rose 2.8% from a year ago and the core rate to 2.2% which is one tenth from matching a 10 yr high. 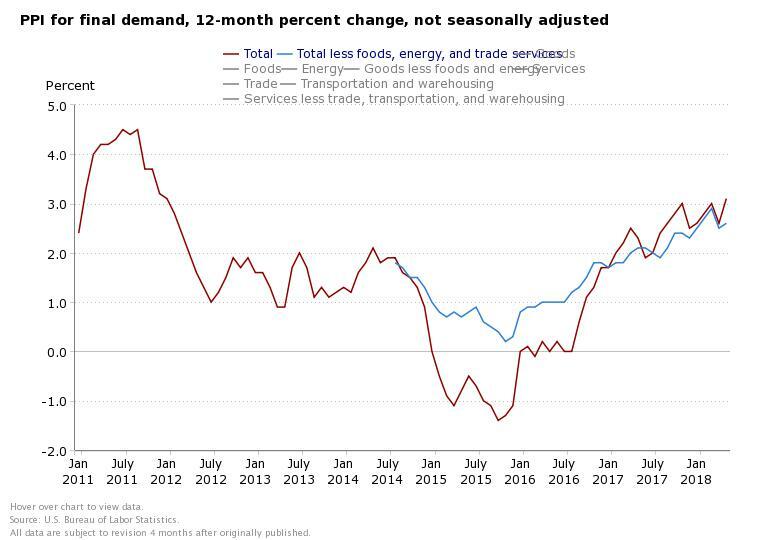 Year on year changes: Energy +12% (led by gasoline); Food +1.2%; Rent of a Primary Residence +3.6%; Medical care costs +2.4%; Goods (ex food and energy) -.3%; Used car prices -1.7%; New car prices -1.1%; Apparel +1.4%. 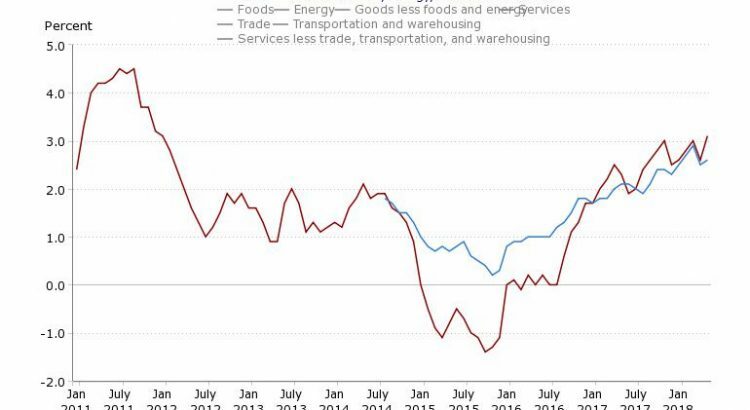 Overall, the CPI is rising as you can see in the chart below. Producer Price Inflation (PPI) ran higher than expectations for May thus adding to the theme of rising inflation in 2018. The headline gain was 3.1% year on year (2.4% core) which is the highest since December 2011. Half of the advance in the index for final demand goods is attributable to a 9.8% increase in gasoline prices. The European Central Bank has signalled that it plans to wind up its historic €2.4tn bond-buying programme at the end of this year, calling time on an extraordinary policy that many economists credit with reviving the eurozone economy but which became increasingly divisive within the bank itself. Whoever says investors aren’t excited about the prospect of thawing relations between North Korea and the world hasn’t been looking at South Korean construction stocks. 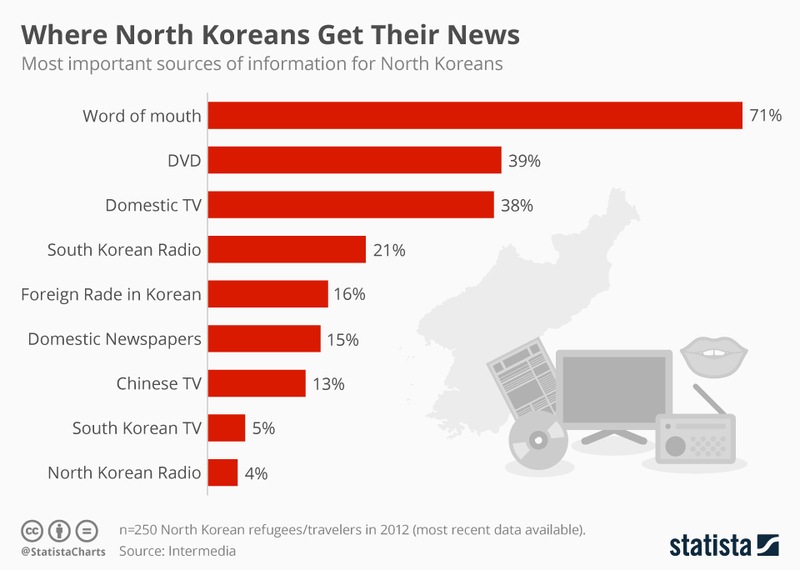 Take a small company called Busan Industrial Co. South Korean President Moon Jae-in has been pushing plans to connect the North and South Korean economies, including opening air, road and rail links that would require major construction efforts. Elizabeth Holmes, the founder of blood-testing start-up Theranos, has been accused of defrauding investors, doctors and patients by US prosecutors. The charges against Ms Holmes and her former number-two at Theranos, Ramesh Balwani, were announced by the US Department of Justice on Friday afternoon. Prosecutors said Ms Holmes and Mr Balwani “not only defrauded investors, but also consumers who trusted and relied upon their allegedly-revolutionary blood testing technology”. The indictment on two counts of conspiracy to commit wire fraud and nine counts of wire fraud follows civil charges earlier this year brought by the Securities and Exchange Commission. The rout in the Argentine peso has spread to the bond market, with prices for the country’s century bond sliding to a fresh low. The $2.7bn issue, which was sold to much fanfare just a year ago, was trading at 79.1 cents on the dollar on Friday. That’s down from the near 87 cents it stood at a week ago and a long way off from last October when it was trading at above par. The most powerful US banking regulator has approved a rule capping credit exposures, in a move designed to limit the risk of one big bank dragging down the rest. On Thursday, the board of the Federal Reserve in Washington approved a rule requiring any bank holding company with more than $250bn in consolidated assets to limit its credit exposure to any particular counterparty to a maximum 25% of its Tier 1 capital. Foreign banks operating in the US with more than $250bn in assets worldwide, and their US holding companies with $50bn or more in assets, would be subject to similar caps. The banks will have to comply with the rule by 2020.